It seems that almost every collector has a fondness, or at least respect, for vintage cards. There may be no better indicator of that sentiment than the annual success of the Topps Heritage brand. 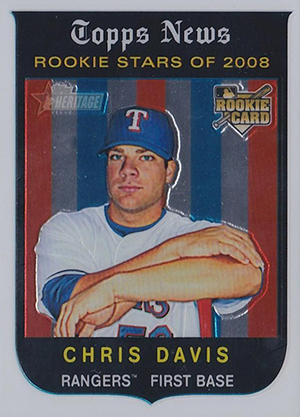 The release of the 2008 Topps Heritage High Number Baseball marked some "firsts" and was distinctive in some other ways as well. 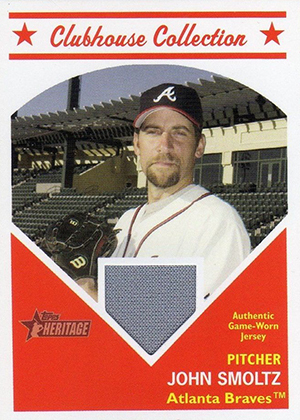 2008 was the first year that Topps released an “update” set for Heritage. 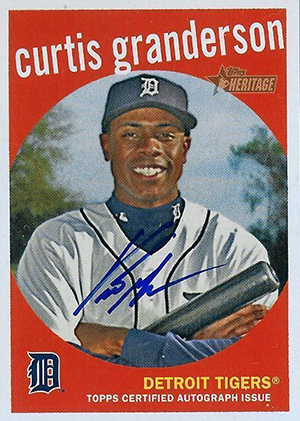 Oddly enough, it was piggy-backed with another Topps brand, which ultimately resulted in the longest product name in the history of the hobby, 2008 Topps Updates & Highlights Presents Topps Heritage High Number Series. The design follows the form of the original release, which honors 1959 Topps Baseball. The player photo is circular and takes up the majority of the card. It is framed quite nicely by a solid, single colored border. The text on the card is minimal but purposeful and clean. A nice touch, is the player's name in all lower-case letters, adding to the vintage look. The card backs are an exact replica of the 1959 Topps cards, all the way down to the, sorely missed cartoons dedicated to trivial minutiae about the player. The clay-back stock of the cardboard adds to that vintage feel and is a must for a product of this type. Another signature of any Heritage release is the inclusion of short prints and variations. As is to be expected, 2008 Topps Heritage High Number Baseball has those in abundance. A total of 35 cards from the 220-card checklist are short prints. These are inserted at a rate of 1:3 hobby packs. Of those 35 cards, nine are rookies including Gio Gonzalez, Matt Joyce and Brad Ziegler. 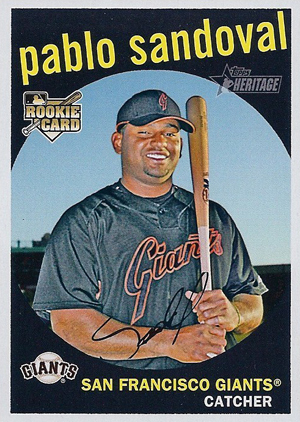 Other notable non-SP rookies include Max Scherzer, Evan Longoria and Pablo Sandoval. Unlike the main 2008 Topps Heritage set, there are no photo variation cards or manufactured error cards distributed in the High Number series. However, the card-back variations did continue into this release. There are 35 cards that have a variation on the back of the card where black ink is used instead of the usual green ink. Without getting too complicated, here’s how the math for the Black Back cards works. Each card is printed in the same quantity throughout the set. Those 35 cards that have Black Back Variations were still printed in the same quantity as the rest of the set. However, 50% of the run was with black ink and 50% of the run was with green ink. So, while the overall scarcity of the card of the player is no different from that of other players, there just happens to be two versions to collect instead of just one. Another staple of Topps Heritage is the Chrome cards. While not necessarily a parallel to the base set release, these cards do serve as another element of chase for team and player collectors. Featuring their own numbering system, these cards are an identical match to the base cards. They also have a pair of parallels: Refractors (#/1959) and Black Refractors (#/59). These inserts are actually repeats of the ones that first appeared in 2008 Topps Heritage. However, there is a new 15-card set covering the top rookies from the 2008 season called Rookie Performers. Then and Now also adds ten different cards from the original release. 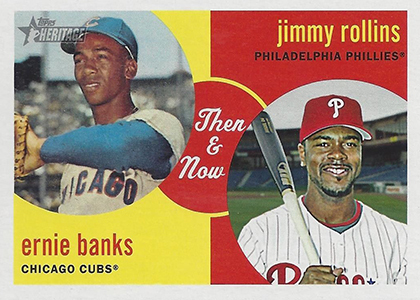 Topps Heritage is the perfect marriage between modern collecting and the hobby's love affair with vintage cards. It serves as a bridge to the hobby's past. 2008 Topps Heritage High Number Baseball is a set that allows you to enjoy opening a pack of cards that brings you back to the innocence of when card collecting was simply ripping a wrapper and seeing what you got. For additional commentary on 2008 Heritage High Number Baseball, listen to the November 6th, 2013 episode of Cardboard Connection Radio. 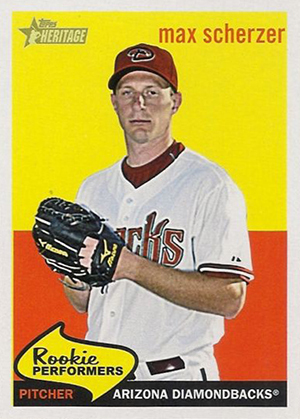 The episode also includes an interview with Brad Ziegler, a rookie in the set as well as an avid card collector. 220 cards. Numbering continues from where the main 2008 Topps Heritage checklist left off. Love the Heritage brand. Not a big fan of so many different types of inserts packs come with these days, but the inserts for Heritage are very nice. It screams mid-20th century artistic style.